Most of us want to get bigger and stronger at the same time. But most guys or gals that follow a bodybuilding-style program aren’t building much strength. So today I’m going to outline a workout you can put in your current bodybuilding program that will fill in the much-needed gaps. That’s important because if you increase your full-body strength you’ll be able to lift heavier loads in your bodybuilding workouts. This, in turn, will make it easier to build muscle in your other workouts. There are many types of strength, so when I talk about strength-training I always make it clear to my audience what type of strength I’m talking about. In most cases, I’m referring to maximal strength: your ability to lift the heaviest load possible for 1-3 reps. 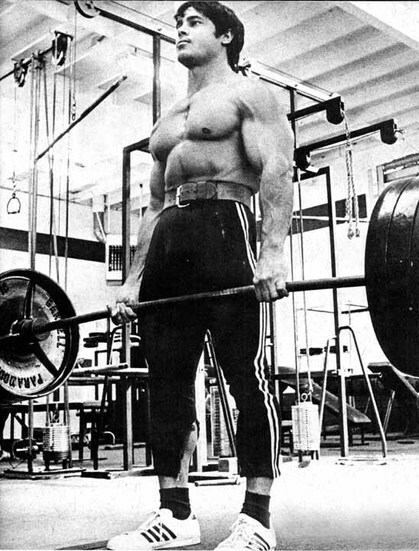 The master of maximal strength, Pavel Tsatsouline, and I have had many discussions on the best way to build it. Russian weightlifters – known as Olympic lifters to us in the states – spend most of their training cycle in the 80-85% of one-rep max (1RM) training zone. That fact will be surprising to many since it’s typically best to train with heavier loads than 85% of 1RM if you’re far from your maximal strength potential. For example, if you can’t deadlift twice your body weight without lifting gear you’re pretty far from what your body is capable of pulling. In other words, I would define a guy that can do a raw, double-body weight deadlift with an unmixed grip as a solid, intermediate lifter. For him, training in the Russian’s 80-85% of 1RM zone might be sufficient. Why? Because those Russian weightlifters train with a very high frequency (they typically bench press six times per week – yikes)! Furthermore, lifting is their job. Indeed, they’ve spent decades building up to that training frequency, their nutrition and recovery modalities are spot on, and they have little else to worry about. Most of us don’t have the time and energy to do what the Russian weightlifters do. Therefore, the other option that’s been battle-tested for eons is to cycle loads that around 90% of 1RM into your program. The following protocol is for people that have been primarily training with sub maximal loads (85% of 1RM or less) and want to quickly boost their maximal strength while still maintaining their current training program. How to Make it Work: do the following the workout one day per week in place of one of your bodybuilding-style workouts. Duration: 12 weeks (you can go longer if you feel the need). Workout Circuit: I favor full-body circuits for maximal strength training because they allow for more rest before repeating an exercise while still staying efficient with your time. There’s no need to sit around for 3-5 minutes between sets when you could be working another body part. Workout Explanation: there are hundreds of different exercises you can use to fill in the above circuit, and that’s a good thing because you must manage fatigue. Lifting 90% of 1RM for the same exercise – even if it’s only once per week – can beat you up pretty fast. Therefore, every two weeks choose a new exercise for each category. For example, weeks 1-2 you might do a one-arm dumbbell row for your upper body pull; then weeks 3-4 you’ll do a pull-up. Or you might use the Romanian deadlift for your “lower” body exercise during weeks 1-2 and then switch to a reverse lunge for weeks 3-4. You get the idea. Training Parameters: each workout will start the same way. First, you’ll go through the entire circuit 2-3 times with loads that rate as 5-6 on a scale of 1-10. This will turn on your nervous system and prepare your joints. Then you’ll perform three rounds (work sets) of either 3, 2 or 1 reps per set, based on the week, with the heaviest loads you can manage that day. Don’t worry about getting the loads perfect for the work sets. It’ll probably take you one round of the work set after the warm-up sets to get a feel for your strength that day. Try to ramp up your training loads for the two rounds that follow. Again, you’ll do this workout once per week in addition to your other sub maximal training workouts. The point is to develop full-body strength while still keeping your current bodybuilding-style program in place. You’ll notice in the circuit listed earlier that before you do any squat, deadlift or lunge variation you’ll always do the stir the pot or side plank with a leg lift exercise. The reason is because those are two of the best core exercises to increase spinal stability: an important element for boosting your full-body strength while protecting your spine. Now you have a simple way to add strength to any bodybuilding program! This entry was posted in Gain Strength by Dr. Chad Waterbury. Bookmark the permalink. CW: Thanks Steve. The parameters would change for multiple workouts per week because you would need more volume. This info is specific for a bodybuilding style program that needs more strength training. I’m currently following the V1 program in your HFT book. Can I replace one of the low reps days with this and see gains, or is it mostly the same? I like a little variation in programs so I wanted to try this. CW: Stick with HFT2 the way it’s written. It’s never a good idea to mix and match programs or workouts. Everything in HFT2 has a specific purpose. However, you can do this workout once in a while as a change of pace. But don’t add this workout into HFT2 on a consistent basis. Chad, this is brilliant and so simple. Nice work. Is there any post-activation-potentiation by doing the 2 ab exercises before the heavy leg exercises? Is there any risk that pre-fatiguing the abs right before heavy compound leg exercises might make the spine less stable? CW: The core exercise serve as potentiators – not as something that develops fatigue. Doing one of those two moves before a squat or deadlift has helped all my clients. It works awesome.